Fabulous executive home with 3 acres of beautifully landscaped grounds, park like setting, & waterfall is just minutes from Wildwood Town Center. Updated kitchen w/granite counters, stacked backsplash; gas cooktop & stainless appliances. Stunning dining room W/coffered ceiling. 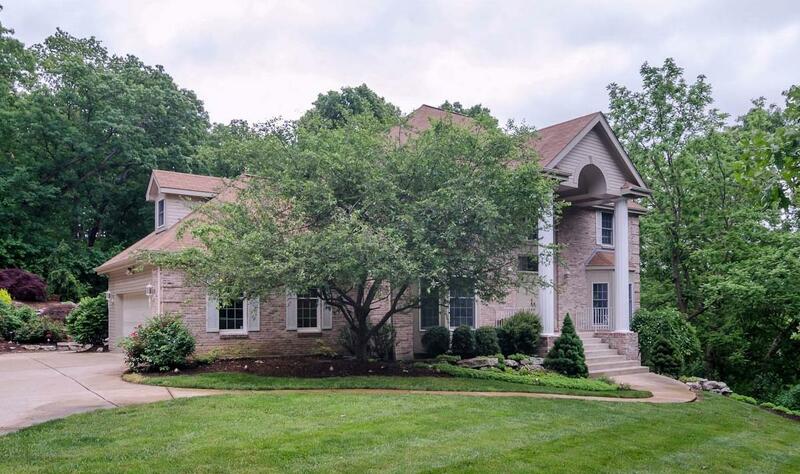 Open floor plan, dramatic 2 floor entry w/ gorgeous hardwood floors throughout main level. Spacious 2 story great room w/wall of windows, & fireplace. Studio/Den w/natural lighting & great view. Main flr laundry. 37x21 ft. deck, Stepping stone path to built-in bbq grill & firepit, irrigation system & electric pet fence. Master Bed/r suite has double French doors, amazing view of grounds. Master bath w/custom double shower heads, slate floors & shower, separate his & her sinks. Lower level in-law quarters with full kitchen, fireplace & walkout. Over 3600 sq ft. of total living space. Listing Last updated 04/04/2019 2:01 PM CDT . Some properties which appear for sale on this web site may subsequently have sold or may no longer be available. Walk Score provided by Walk Score. Mapping data provided by Google and Bing.